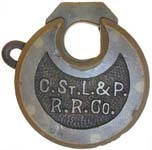 "C.&O RY.Co˙" - Abbreviated Left Pin - Sample. 2.475" high x 2.300" diameter x .580" deep. 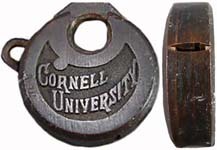 In 1920 this lock and the high shackle variety #58 were made for C&O by Slaymaker. 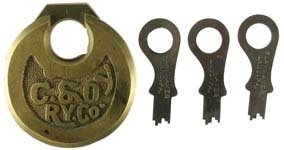 Only the high shackle variety was selected for service and this lock was never ordered. This is reported to be the sample that was not selected. Made for: California & Oregon or Carrollton & Oneida or Chesapeake & Ohio or Chihuahua & Oriente or Covington & Ohio or Cumberland & Ohio or Confluence & Oakland. Mfg by: Slaymaker. (17.7). 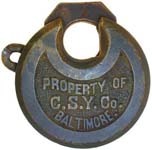 "C.&O RY.Co˙" - Abbreviated Left Pin - High Shackle. Made for: California & Oregon or Carrollton & Oneida or Chesapeake & Ohio or Chihuahua & Oriente or Covington & Ohio or Cumberland & Ohio or Confluence & Oakland. Mfg by: Slaymaker. (17.9). "C.&O. RY.Co." - Left Pin. Made for: California & Oregon or Carrollton & Oneida or Chesapeake & Ohio or Chihuahua & Oriente or Covington & Ohio or Cumberland & Ohio or Confluence & Oakland. (17.8). "C.&O. RY.Co." - Left Pin - High Shackle. Made for: California & Oregon or Carrollton & Oneida or Chesapeake & Ohio or Chihuahua & Oriente or Covington & Ohio or Cumberland & Ohio or Confluence & Oakland. (18.0). "CALIFORNIA" - No Pins. 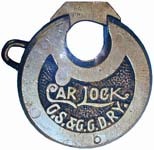 Mfg by: D. K. Miller Lock Co. (21.0). "CALIFORNIA" - No Pins - High Shackle. Mfg by: D. K. Miller Lock Co. (21.1). "CANADA CUSTOMS" - No Pins. Made for: Canada Customs. Mfg by: Miller Lock Co. (22.0). "CANADA EXCISE" - No Pins. Made for: Canada Excise. (22.5). "CANADA P. O." - No Pins - Letter Style 1. Made for: Canada Post Office. (23.0). "CANADA P. O." - Left Pin - Letter Style 2. The lettering and punctuation is different than #49. Made for: Canada Post Office. (23.2). "CANADA RWY. NEWS CO· LTD· TORONTO." - Left Pin. Made for: Canada Railway News Co. (23.4). "C.C.C.&St.L. •RY•" - 2 Pins. Made for: Cleveland Cincinnati Chicago & St. Louis. The following patent dates are stamped on the left edge of the case: 10-21-73, 3-11-02. Mfg by: Miller Lock Co. Patent #'s 143831 , 695347. (19.0). "C.G.W. R•R•" - Left Pin. Made for: Chicago Great Western. The following patent dates are stamped on the left edge of the case: 7-26-70, 10-21-73, 3-11-02. Mfg by: Miller Lock Co. Patent #'s 105710 143831 695347. (37.5). 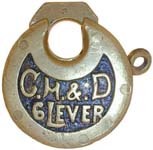 "C.H.&.D 6LEVER" - No Pins. Made for: Cincinnati Hamilton & Dayton. (38.9). 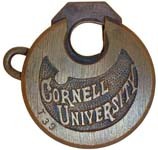 "C.H.&.D 6LEVER" - No Pins - High Shackle. Made for: Cincinnati Hamilton & Dayton. (39.0). 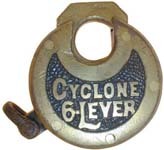 "CHEROKEE 6•LEVER" - No Pins. (36.0). "CHICAGO & GRAND TRUNK RWY." - No Pins. Made for: Chicago & Grand Trunk. (37.0). "CLARK 6-LEVER" - No Pins. (38.5). 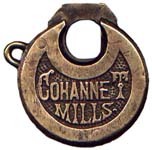 "COHANNET MILLS." - No Pins. Made for: Cohannet Mills, Taunton, Massachusetts. A cotton spinning mill in the late 1800's. (39.2). "COLUMBIA 6-LEVER" - No Pins. Mfg by: E. T. Fraim Lock Co. (40.0). "CROWN 6-Lever" - 2 Pins. Mfg by: Miller Lock Co. (45.3). "C.St.L.&P. R.R.Co." - No Pins. Made for: Chicago St. Louis & Pittsburg. (20.0). "PROPERTY OF C.S.Y. Co. BALTIMORE." - No Pins. Made for: Chesapeake Stock Yards Co. (45.5).